Music has a big ol' sliver on the pie chart of my life. I spend one evening a week, with Logan and our banjo playing friend Ben, playing drum and singing and drinking wine and giggling about toast bars. The rest of the week I come up with bits and pieces of song with Logan while we dance around the kitchen with big mugs of coffee, hashing out eggs and avocado toast in the AM. Sometimes I play shows. Sometimes I play open mics. Sometimes I just hang around my house alone and loudly sing songs about grilled cheese and krishna and the digital age (usually not all at once). I may or may not simultaneously do pirouettes/jazz hands in my kitchen. We played a great house show last night at Ash Lawn Highland in a cabin that one of the U.S. presidents grew up in. Still a bit boggled by that, honestly. Logan and Ben and I have been working on this folk-bluegrass project since last March sooooo you could say we're into being prepared. Last night was only our third show as a group. I've got my fingers crossed we can get some music recorded and on the internet sometime this year. In other news: our test kitchen cocoa roaster is IN OUR HOUSE! And our cocoatown grinder (the machine that liquifies the cocoa beans) is on its way. So, in celebration I decided to sprinkle everything with cacao nibs. 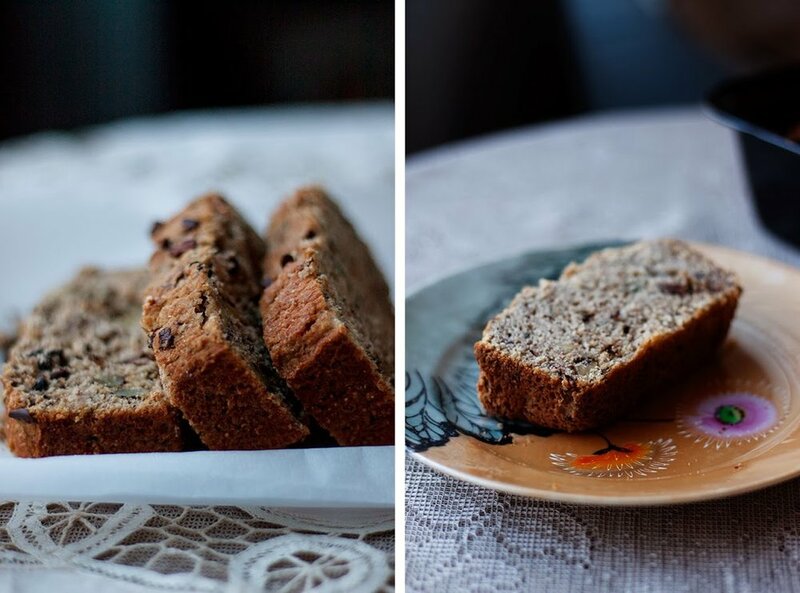 Banana bread is awesome for the same reasons. Scones and drop cookies are awesome -- it whips up quick, tastes fancy, and look spectacular with sprinklings of nuts/chocolate/dried fruit on top. Walnuts, cinnamon, vanilla, banana, NIBS?! The only that could make this banana bread better is taking a big bite of it and then taking a big swig of black coffee (discovery credit to Logan). 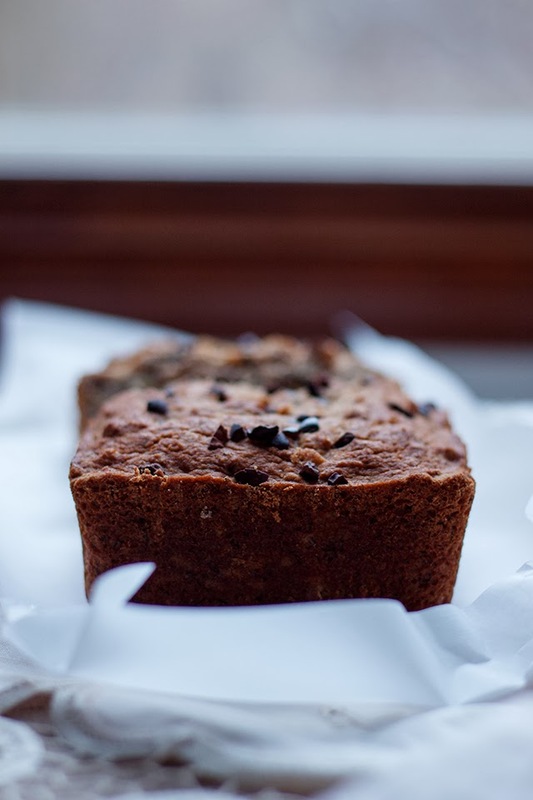 Author: Renee Shuman (Will Frolic for Food) - Cook time: 40 mins- Total time: 40 mins - Makes: two loaves of gluten free banana bread - Notes: I personally think this loaf is even better the second day. Preheat oven to 325F. Grease two 7 x 4 x 3 inch loaf pans with coconut oil. In a large bowl, mix together gluten free all purpose and coconut flour, sugar, baking powder, baking soda, cinnamon and salt. Add almond milk, coconut oil, vinegar, eggs, and mashed banana. Stir in walnuts, chocolate chips, and vanilla bean seeds. Fill each loaf pan half way full, and pop in the oven. Bake 40 minutes, rotating at 20 minutes. Loaves are done when a toothpick or sharp knife inserted in the center comes out clean. Let cool 20 minutes before slicing in, or it will be rather crumbly. Vegan Salted Hot Chocolate + Edible Blue Ridge Feature!